Steven (Chicagoland, United States) on 14 June 2010 in Architecture and Portfolio. The Lincoln Memorial, designed after the temples of ancient Greece, is significant as America's foremost memorial to her 16th president, as a totally original example of neoclassical architecture, and as the formal terminus to the extended National Mall in accordance with the McMillan Plan for the monumental core of Washington, DC. The exterior of the memorial echos a classic Greek temple and features Yule marble. The structure measures 189.7 feet by 118.5 feet and is 99 feet tall. 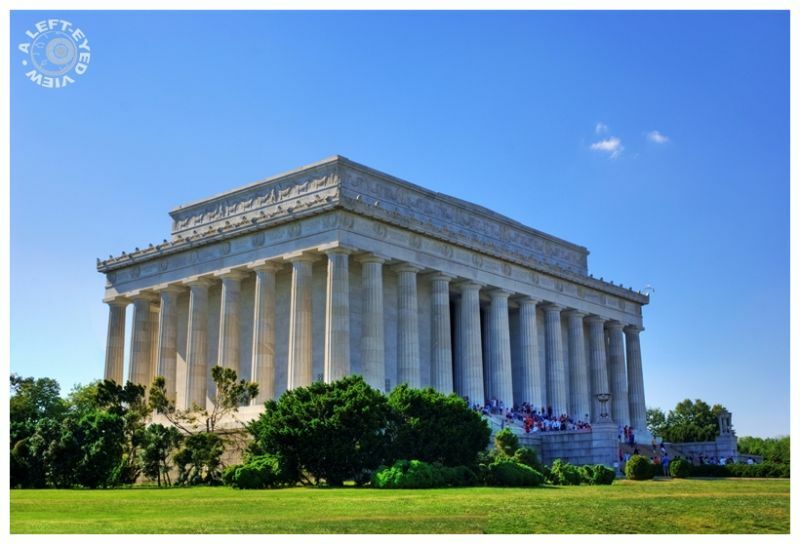 It is surrounded by a peristyle of 36 fluted Doric columns, one for each of the 36 states in the Union at the time of Lincoln's death, and two columns in-antis at the entrance behind the colonnade. The columns stand 44 feet tall with a base diameter of 7.5 feet. Each column is built from 12 drums including the capital. The columns, like the exterior walls and façades, are inclined slightly toward the building's interior. This is to compensate for perspective distortions which would otherwise make the Memorial appear asymmetrical. Very nice work on this and I really like the bright blue sky with the small touch of cloud! Thanks for the history also! Amazing! Now, what a fantastic perspective on this one! As always your compositions are perfectly different in my opinion - really nice job Steven And the background information is really appreciated. Great stuff! Love the little wisp of clouds. Great temple! In this vast park it has a strong impact. Nice perspective of it Steve, different to the normal head on views available all over the internet. Beautiful shot.... another five star for me. Been there. A magnificent place and a wonderful way to remember this great American. Am curious as to who is in the crowd on the steps. Make that "nosy" as in, I want to know. Heh. This is beautiful! Color, composition,beautiful! This should be in a magazine! A very beautiful image of this great memorial! I like this a lot. Another one of those postcards right there as it sits.. and a 5!